It's a peculiar fact that there are only two castles in Greater London. One is the Tower of London, obviously, William the Conqueror's great fortress by the Thames. But the other is rather further out, by no means as well preserved, and considerably less well known. Here it is. I don't know if the photo helps. We're in Ruislip, at the top of the High Street, just beyond the parish church, Prezzo and Cafe Rouge. 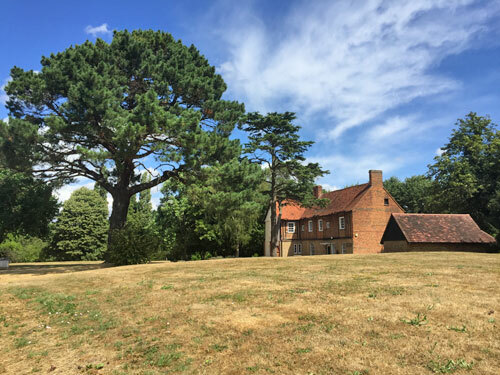 Specifically we're at Manor Farm, 22 acres of open space and old buildings under the care of Hillingdon council, and the borough's flagship heritage and culture site. The Manor House dates back to 1508, so the entire site got a makeover ten years ago in time for the quincentenary, and very good it all looks too. I suspect most visitors come for the library, tearoom, bowling green or theatre, or simply for a bit of a runaround. But I came for the motte and bailey castle. You'll remember these from school, a wooden fortification on a grassy mound surrounded by a defensive enclosure, and very much at the basic end of the Norman castle-building scale. This grassy mound now forms the centrepiece of the site here at Ruislip, not especially lofty but clearly raised, and domed, and with an overgrown ditch running around most of the perimeter. Head round to the north and you can walk straight in, 365 days of the year, and sit down amid the scrappy daisies and convolvulus. You might even find a leather shoe or Caffè Nero bag discarded round the back of the shrubbery, indicating that others have enjoyed the castle before. From up here, a couple of metres above the passing throng, there's a good view of the cluster of timber barns across towards Bury Street. The Great Barn is reputed to be the largest timber-framed 13th century building in the capital, at 36m long, and was used to store grain and other crops. These days it's a function space, hosting a rather good Sunday market twice a month, and numerous money-spinning events and weddings at other times. 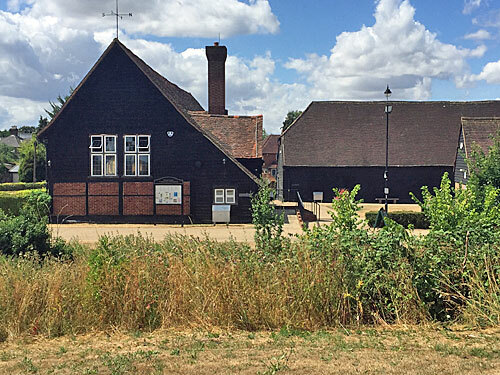 The smaller Tudor barn is now used as Ruislip's library, which probably beats yours, and the former stables are now the Cow Byre cafe for snacks, refreshments and cream teas. But what you'd probably enjoy most is a look in Manor Farm House, a very fine brick building, once the hub of communal life hereabouts. Its downstairs rooms are now a small museum, nicely pitched, 2008 being recent enough for polished informative displays, but not so recent that the whole thing is an interactive bore. One room focuses on the house, its history and its restoration. Where else in London will you find a display case containing Green Wallpaper c1790, the Skeleton of a Squirrel and a Caramac Wrapper c1959, each individually labelled? 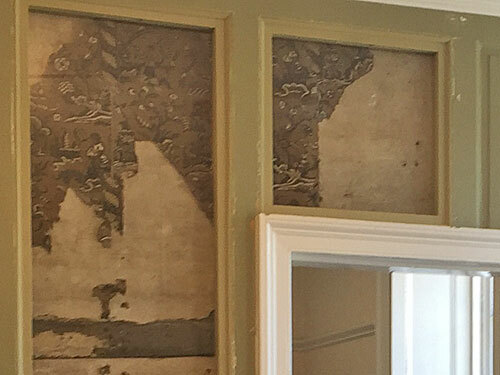 Ruislip Manor House also contains England's oldest surviving wallpaper in situ, a fashionable scrap of late 17th century design uncovered in the hallway during renovation. The larger gallery ruminates on what life would have been like in a hierarchical agricultural set-up (not necessarily fun), and includes a map revealing how large the enclosure around the site used to be. 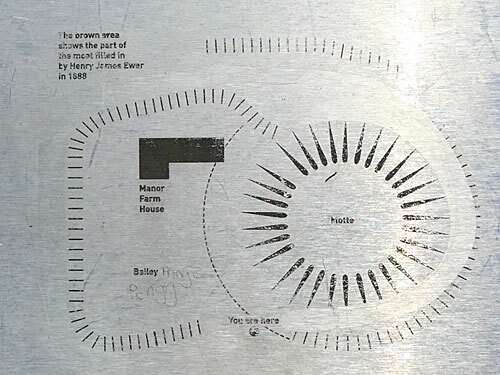 It once stretched all the way out to the woods surrounding Ruislip Lido, and apparently you can still find earthworks there (not that I had any success). 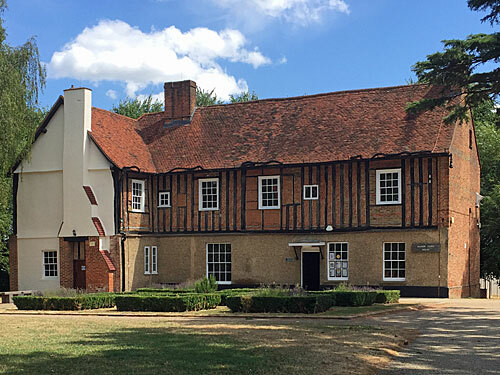 Room 3 is more the domain of the Ruislip, Northcote and Eastcote Local History Society, one of outer London's venerable heritage custodians, who boast a monthly programme of talks and visits and an admirable focus on original research. Their summer exhibition looks at local leisure - an impressive amount of pinned-up effort for what'll only be a six week run. Here are my five favourite facts. 1) Events at Ruislip Sports Day in the Edwardian era included climbing a slippery pole and catching a greased pig. 2) When the Olympic Marathon came to Eastcote in July 1908, bringing unheard of traffic congestion, it was the first time a bus had ever passed through the village. 3) Ruislip's most famous tearooms - The Poplars - had seating for 1500 to accommodate East End hordes visiting by train. Adults' Tea cost ninepence a head, which included fancy biscuits, rock cakes and buttered scones. 4) In June 1935 the Bugatti Owners Club organised a Great Speed Hill Climb at Northwood Hills, featuring 'Many Crack Drivers From Brooklands'. Miss D. Evans took the cup for the fastest time by a lady driver. 5) Since 1990 the water level in Ruislip Lido has been kept artificially low to reduce the risk of a dam burst... which put an end to sailing and water skiing. But what intrigued me most was the display about Ruislip Castle itself. It said the grassy mound was 'thought to be' the remains of a motte and bailey. It said there's 'no mention' of such a structure in the Domesday book, which is precisely the time it should have existed. It said that despite several archaeological explorations, 'no physical evidence' of a castle has ever been found. The site is protected as an ancient monument, so the turfed lump inside a thistly ditch must be the remains of something. But however worthwhile a trip to Manor Farm may be, perhaps the Tower of London is the only castle in the capital after all.